Spare Change News (SCN) is a street newspaper founded in 1992 in Boston, Massachusetts for the Greater Boston Area and published out of the editorial offices in Cambridge, Massachusetts through the efforts of the Homeless Empowerment Project (HEP), a grassroots organization created to help end homelessness. The Homeless Empowerment Project is a 501(c)(3) not-for-profit corporation registered in the Commonwealth of Massachusetts, with an annual budget in 2012 of $130,000 and six staff members, all part-time. The newspaper offices are headquartered in the Old Cambridge Baptist Church. Since the founding of Spare Change News, the price of the newspaper has varied. Originally it was sold for $1 and the vendor paid 25 cents for a copy making a profit of 75 cents on each paper sold. As of September 2016, a vendor pays 50 cents for each copy of the paper, then sells it on the streets for $2. As a result, the vendor makes a $1.50 profit for each newspaper sold. There are approximately 100 active vendors in the greater Boston area at any one time. The biweekly, 16-page paper contains a color front and back page, alternative news, arts features, interviews, fiction and poetry that are written by staff writers and journalists, as well as by people who are homeless or work with the homeless. A full page is devoted to listings of local centers for job/skills training, senior care, women's care, drug recovery programs and homeless shelters. Circulation is roughly 10,000 per issue. HEP/SCN rely on grants and donations to publish the newspaper, but the organization works to increase its advertising revenue to become self-sufficient. "When people think of helping the poor and homeless, they usually think of food and shelter," Harris said. "Those things are necessary, but it's more than that. It's the spiritual. The homeless need to express themselves and be a part of the community. It's important that they have human dignity". The first issue of Spare Change News was published on Friday, May 8, 1992. The newspaper's first managing editor, Tim Hobson, said at its founding that it would be "heavy on politics as well as discussion of homeless empowerment". He also said an important goal was to "put a face on the homeless to show that we're human beings". MIT Professor Noam Chomsky, together with his friend, the historian Howard Zinn, were some of the first major supporters of Spare Change News. In June 1993, one of the founders, James L. Shearer, appeared before the Boston City Council to accept a special commendation on behalf of Spare Change as the newspaper celebrated its one-year anniversary. In July 2002, Spare Change News and the Homeless Empowerment Project hosted the Seventh Annual Conference of the North American Street Newspaper Association. In May 2004, Spare Change News hired journalist Samuel Scott, who was a Boston University graduate as well as former Boston Courant reporter and Boston Globe editorial assistant, to be its first professional editor. He changed the tone of the paper from advocacy journalism to objective reporting on social issues and revamped it from a black-and-white broadsheet into a color tabloid. He was later executive director of the Homeless Empowerment Project. In November 2007, Boston's South End street newspaper Whats Up Magazine disbanded and merged into Spare Change News under the umbrella of the Homeless Empowerment Project. On February 28, 2008, Whats Up published their first 4-page insert inside Spare Change News. In 2008, Spare Change News received a grant from The Harbus Foundation of Harvard University Business School, to use it "to support a long-term marketing strategy to increase the awareness of the organization amongst the general public and generate broader distribution and commensurate aid for its vendors." 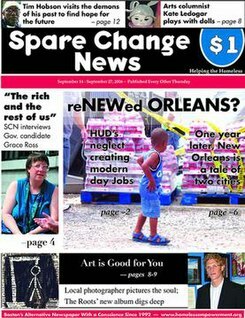 In October 2010, a Worcester, Massachusetts edition of Spare Change News was launched. It is a collaboration of Spare Change News and the Worcester Homeless Action Committee. In July 2011, Tom Benner, a veteran journalist and former head of the Massachusetts State House bureau for The Patriot Ledger newspaper, joined as the new editor-in-chief. In June 2012, Vincent Flanagan, Esq., was appointed Executive Director of the Homeless Empowerment Project/Spare Change News. Mr. Flanagan was previously Development Director for Legal Affairs for Give Us Your Poor, and served in various senior level and managerial positions during his 25-year career with the federal judiciary, such as Circuit Executive for the United States Court of Appeals for the First Circuit in Boston, Massachusetts. In August 2012, the Reverend Osagyefo Uhuru Sekou, a Pentecostal (Church of God in Christ) Christian minister, community organizer, and activist who studied religion at Harvard University and Union Theological Seminary in New York, joined Spare Change News as Editor-in-Chief. Reverend Sekou was interviewed by Callie Crossley on WGBH Radio in Boston on August 29, 2012 about the mission and future of the newspaper. In August 2015, Ms. Katherine Bennett was hired as Executive Director of HEP/SCN replacing Vincent Flanagan who had been on board for several years and had moved with his family out of state. Bennett, who is from the South Shore of Greater Boston, was involved in many homeless advocacy projects and was a journalist. On June 21, 2012, Spare Change News celebrated its 20th anniversary in the Harvard Room at the Inn at Harvard in Cambridge. In attendance was Cambridge City Councilor Marjorie C. Decker, and the keynote speech was delivered by Massachusetts State Representative, Byron Rushing. One of the founders, Tim Harris, wrote a note to the gathering congratulating the organization for its tenure and especially thanking co-founder, writer, and Board President James Shearer, for his sticking with the organization since its inception and keeping it alive. Musical entertainment was provided by Building Bridges Through Music, and the Follow Hymn Interfaith Choir of Lynn, Massachusetts, with Doreen Murray as featured vocalist. Poetry readings were given by Book of Hope featuring Jordan Tyler Young and Aminata Keita. There was also an exhibit called "The Homeless are not Faceless". In August, 2011, HEP/SCN launched the publication of The Hub Resource Guide, a pocket-sized handbook of resources and services in and around Boston. It is similar in concept to The Rose City Resource published by Street Roots in Portland, Oregon. ^ a b "Off the Shelf with Doug Holder: Interview with Samuel J. Scott, Spare Change News Editor", The Somerville Times, Somerville, Massachusetts, July 23, 2005. ^ a b Bayles, Cara, "Street Sheets: Whats Up Magazine finds a new home"[permanent dead link], Weekly Dig, Boston, February 27, 2008. ^ Mathieu, Paula "The Early Years of Spare Change News: Insights From Its Founding Organizer" Archived 2013-02-23 at Archive.today, Spare Change News, June 15, 2012. Recollections of founding organizer, Tim Harris, and other people involved early on. ^ "Advocate Timothy Harris making a career of empowering the homeless", The Boston Globe, May 30, 1993. ^ Walker, Adrian, "Spare Change for sale Boston's homeless planning a new tabloid to push their message", The Boston Globe, April 6, 1992. ^ Power, Stephen, "Homeless newspaper finds its place in Hub", The Boston Globe, June 24, 1993. ^ Sennott, Adam, "New Leader Appointed at Homeless Empowerment Project/Spare Change News" Archived 2013-03-01 at the Wayback Machine, Spare Change News, June 1, 2012 issue. ^ "Homeless Empowerment Project Welcomes New Executive Director", press release, August 2015. Harris, Tim, "Spare Change Reflection", University of Washington, course H A&S 350A "Street Newspapers, Poverty and Homelessness", Spring 2009. Jefferson, David J. (May 21, 2010). "18 Years of Empowerment". Spare Change News. Cambridge, Massachusetts: Homeless Empowerment Project. Archived from the original on July 24, 2011. Saginaw, Michael A., "IAP Activity Gives Students Chance to Help Homeless", The Tech, Massachusetts Institute of Technology newspaper, January 29, 1993. p. 15. Byron H. Paladin, a founder of Spare Change News speaks about homelessness to MIT students. Simpson, April, "Voice of Homeless Struggles to Stay Afloat: Lagging Sales Hit Nonprofit Paper", The Boston Globe, July 3, 2005.